When it comes to weight loss, limiting your caloric intake is crucial. In fact, to lose 1 pound of body weight a week, you will need to cut 500 calories from your diet each day. Although there are a number of ways to eliminate calories from your diet, replacing one or two meals per day with a bowl of Cheerios can be highly effective. Be sure to keep portion sizes in check for optimal results when it comes to this process. 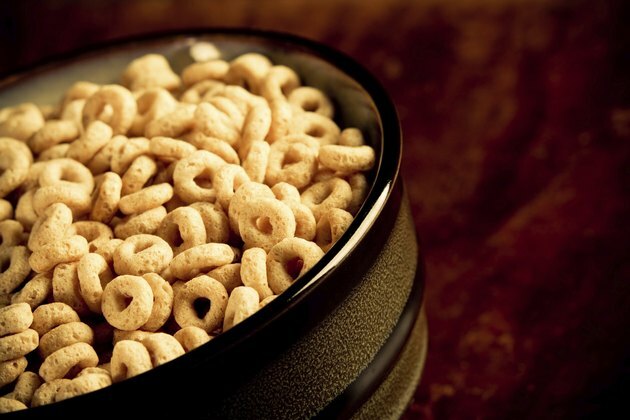 Replace one or two meals per day with a bowl of Cheerios. With only 100 calories per serving -- or 150 when combined with 1/2 cup of skim milk -- the cereal offers an alternative to higher-calorie foods and can be highly effective for people trying to reduce their caloric intake. While some people may choose to eat Cheerios only at breakfast, this product can also serve as a light lunch or dinner when combined with fruit, vegetables and lean sources of protein. Eat a proper portion size. People who wish to achieve optimal results with Cheerios should limit their intake to 1 cup -- or about 8 ounces -- at each meal. Eating more than 1 cup of Cheerios and 1/2 cup of skim milk per meal will increase caloric intake to greater than 150 calories. While this may still promote weight loss in the long run, it will likely take longer due to the increase in calorie consumption. Choose skim milk -- which contains about 50 calories in one 1/2-cup serving -- to maximize weight loss. Skim milk is not only low in calories but also contains fewer grams of saturated fat. This makes it an excellent choice for those who want to promote weight loss and reduce their risk of certain chronic health conditions, such as heart disease and some types of cancer. Top your bowl of Cheerios with nutrient-dense, low-calorie fruits such as berries to increase your nutrient intake while keeping calorie intake low. Include one to two meals that are balanced and nutrient-dense. Be sure to include plenty of fruits, vegetables, lean meats, whole grains and low-fat dairy products in these meals to meet macro- and micronutrient demands while keeping caloric intake in check.